What happens when 3 dyers get together in a garage? A lot of colorful stuff and bad jokes about “when shall we three meet again?” The inaugural dyeing colors were turquoise, orange, boysenberry and grape. Three of those sound like popsicle flavors. This time we mixed lime green and tried sun yellow. 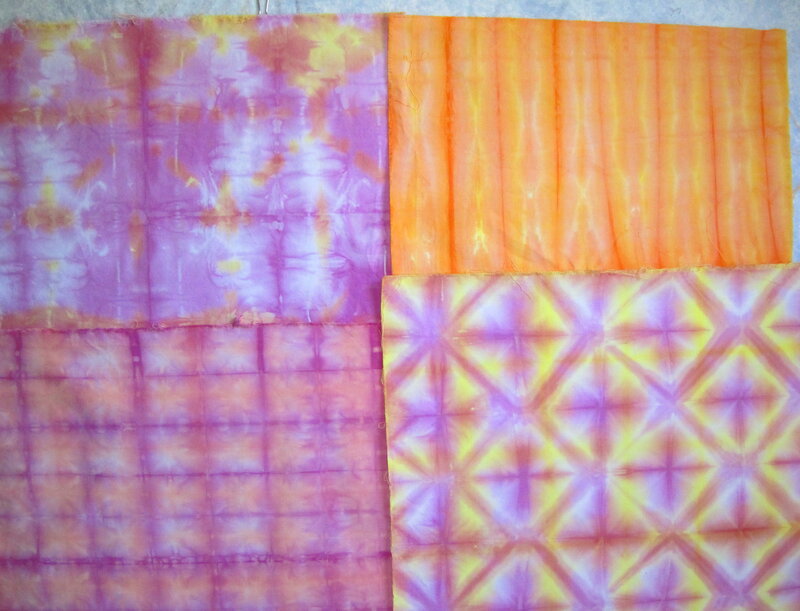 I had interesting effects with the sun yellow when I overdyed on boysenberry after folding my already dyed cloth in various patterns. 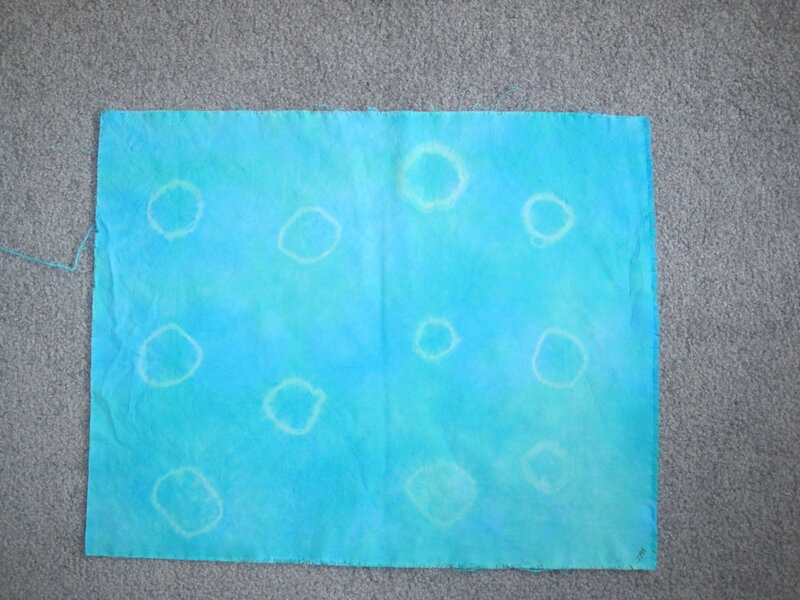 I overdyed my turquoise cloth with the green, which added a subtle richness but didn’t really do anything dramatic. I had hoped the outline of the CDs (yes, CDs) I folded my cloth around would be more distinct, but I think the colors were too similar. 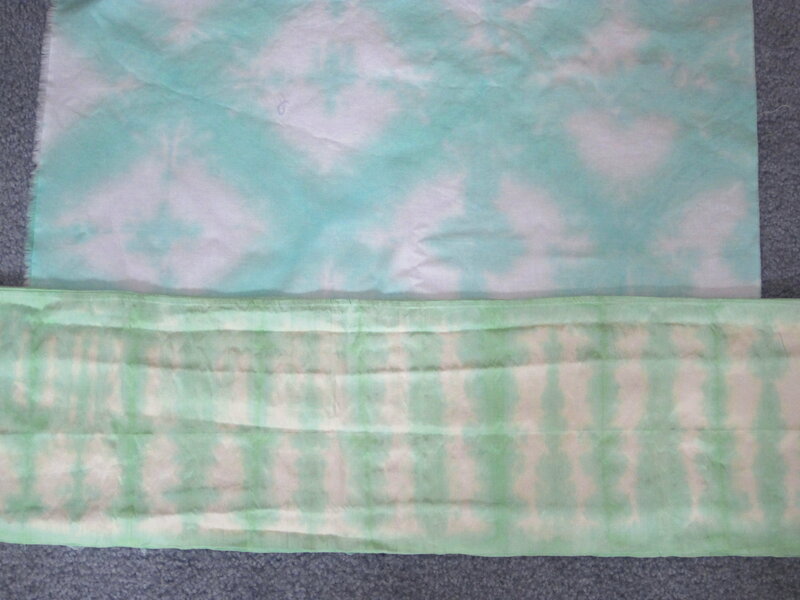 Then I poured green dye over a folded silk scarf and was surprised to see how differently the green came out on silk compared with cotton. I’ll be overdyeing the scarf to take advantage of all that white space left. Next dyeing session I hope to move on to red. I feel the need to complete that classic trio well known to motorists. Our instructor gave us a recipe for making a tomato red dye with boysenberry and yellow. Sounds like it’s right up my alley.